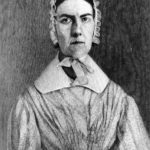 Angelina Grimke was an American political activist, women’s rights advocate, supporter of the women’s suffrage movement, and besides her sister, Sarah Moore Grimke, the only known white Southern woman to be a part of the abolition movement. While she was raised a Southerner, she spent her entire adult life living in the North. The time of her greatest fame was between 1836, when a letter she sent to William Lloyd Garrison was published in his anti-slavery newspaper, The Liberator, and May 1838, when she gave a speech to abolitionists gathered in Philadelphia, with a hostile crowd throwing stones and shouting outside the hall. The essays and speeches she produced in that two-year period were incisive arguments to end slavery and to advance women’s rights. "Women ought to feel a peculiar sympathy in the colored man’s wrong, for, like him, she has been accused of mental inferiority, and denied the privileges of a liberal education." "I trust the time is coming, when the occupation of an instructor to children will be deemed the most honorable of human employment."